Fill the Bloodstone Chalice from the Bloodspring at Redwater Den. Fill the chalice at Redwater Den. Having completed Bloodline and accepted Lord Harkon's gift, speak to Garan Marethi to deliver Harkon's message. Though vague, he will understand and tell you about the Bloodstone Chalice, an artifact able to increase the potency of vampire powers. He'll ask you to follow him to the artifact; along the way, you'll come across Orthjolf and Vingalmo, whose interest in your task hints towards things to come. Garan: "Excuse us. I need to fetch the Bloodstone Chalice." Orthjolf: "What're you up to, Garan?" Garan: "Lord Harkon's orders, Orthjolf. Calm yourself. Our friend here has been ordered to fill the Chalice." Garan: "Indeed. He/She's off to Redwater Den." Vingalmo: "Well, then... Best of luck to you." 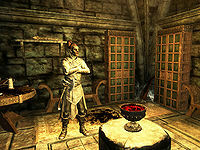 Continue on to the chalice room, where Garan will give you your detailed orders. You'll need to travel to Redwater Den and fill the chalice from the Bloodspring there. Once that's done, you'll need to add the blood of a powerful vampire to it. Garan will warn you that Redwater Den is inhabited by "less reputable members of society", and send you on your way. Pick the lock at the gate, turning the dealer and the attendant hostile should they see you. (Note: After finishing the quest, everyone left alive will be a vampire thrall on your return, some hostile. You may wish to kill them all ahead of time to avoid later inconvenience.) After dealing with them you will enter a large open area filled with various alchemy ingredients, vampires, and their thralls. Fighting your way up the large ramp will lead you past a bridge with a lever, then more corridors. Slowly the amount of enemies will lessen, and Death Hounds will start joining the fights, until you reach a large open room filled with solely vampires and their hounds. Alternatively, if you approach the Dealer, you either have the option of buying some Redwater Skooma, or passing a persuasion check and getting a "free sample" from her. Either way, after drinking it your vision will go blurry, and you will wake up in a cage within large dim room filled with vampires. Unlocking the gate nearby will put you back on the same path as above, allowing you to continue forward from the same point. Thrall: "So why don't you just drink the blood from the spring? I mean, that seems easier than running a skooma den..."
Vampire: "The boss said it's some sort of profaned spring. It looks like blood, but it's not the real thing. Drinking it gives you strength, but it also gets you pretty messed up... That's why we thought of putting it in the skooma." Be careful during the fight against these vampires as there is a gate on the ground that is extremely hard to see due to the low lighting; if stepped on it will open—dropping you in a spike pit below the room and requiring you to climb the spiral ramp back out. Continuing on, you will head up a ramp to the east which leads to a lever you can activate—opening a door directly across from you. From here, you will follow through a fairly linear set of corridors and rooms lined with coffins, most patrolled by vampires and Death Hounds. If you see a Death Hound, there is a good chance it is closely followed by its master. Following along you will encounter Venarus Vulpin. Kill him and take the key to the next door from his body, and finally you will reach the end of the dungeon—the Bloodspring. Approaching the spring will prompt you to fill the chalice; upon doing so, two vampires, Stalf ‎and Salonia Caelia, will enter through the back door. After a short conversation between themselves, it becomes clear that you are to become the latest casualty in Vingalmo and Orthjolf's politicking. Salonia: "It's really too bad, you know. The little accident you had here, completely unexpected..."
Stalf: "Yeah, too bad. Lord Harkon's new favorite, dead so soon after joining the family." Salonia: "We're just lucky I was here to return the Chalice to Vingalmo, so he could make sure Harkon gets it back." Stalf: "Wait, what? That's not what we agreed. We take it back together." Salonia: "Idiot. You didn't really think I'd let you walk out of here either, did you? Vingalmo wants you both dead." Stalf: "Well that's just fine. Orthjolf told me to finish off anyone who got in the way." They will then become hostile toward you, so do what you have to do. Once dispatched, your quest journal will be updated with the objective to "Fill the chalice with the blood of an ancient vampire" which requires you to select one of the two you just killed, filling the rest of the chalice with their blood. Take the door they entered from, which is now unlocked, and you'll find that it leads up to the main area of the skooma den, ending up leading through a hidden door in the stockroom behind the dealer's counter. Once back in the main room, whatever inhabitants are still alive will be vampire thralls. Make your way past these, and return to Garan to tell him what happened. Garan will explain to you that Vingalmo and Orthjolf long for Harkon's throne, but can't make overt moves against him; this is why each sent an underling to kill you and return with the chalice. Robbed of their servants, neither of them will be able to act against him through them any more. He comments on the politics of the court and warns you to be careful who you trust. He then informs you that Harkon wishes to speak to you himself, leading to the next quest. After completing this quest, you will be allowed to take almost everything in the castle freely. Drinking from the Bloodstone Chalice grants the Blood of the Ancients active effect. The potency of this blessing can be increased up to five times by repeatedly doing the quest Ancient Power. 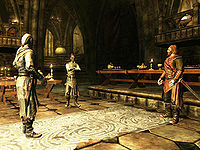 When returning to the castle to complete the quest, everyone inside may turn hostile towards you for no obvious reason. This could be caused from attacking Salonia and Stalf before they turn hostile against you while fetching the chalice. Waiting outside for 24 hours before entering should make them friendly again. If you are unable to start the quest after you have turned into a vampire and you try talking to Garan Marethi all he tells you is to go back to Lord Harkon and get changed back to a vampire, and you are unable to start the conversation with him. To fix this do the following: open the console, and type player.setrace <race>racevampire, replacing <race> with the name of your race (e.g., player.setrace darkelfracevampire if you are a Dark Elf). The dialogue may not trigger between Salonia and Stalf. ? Attack either vampire and the quest should continue as normal. 10 Harkon has asked me to speak to Garan Marethi, telling him simply "It is time." 20 I've been asked to take a special artifact of Harkon's - the Bloodstone Chalice - and to fill it from the spring in Redwater Den. After that, I need to add the blood of a powerful vampire and deliver the chalice to Garan Marethi. 40 While attempting to fill the Bloodstone Chalice in Redwater Den, I was ambushed by Stalf and Salonia, two vampires from the castle. I'll need to kill them before they can kill me. 60 I have filled the Bloodstone Chalice from the spring in Redwater Den, and added the blood of a vampire. I now need to return the chalice to Garan at the castle. 200 Finishes quest I was asked to fill the Bloodstone Chalice from the spring in Redwater Den. 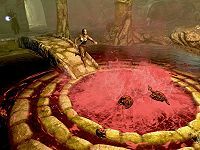 Garan sent me on this task suspecting that I would be followed and attacked by others attempting to overthrow Harkon. By returning the Chalice I have lessened their power and earned Harkon's favor. On the PC, it is possible to use the console to advance through the quest by entering setstage DLC1VampireBaseIntro stage, where stage is the number of the stage you wish to complete. It is not possible to un-complete (i.e. go back) quest stages, but it is possible to clear all stages of the quest using resetquest DLC1VampireBaseIntro. This page was last modified on 24 October 2018, at 06:52.